Get inspired by our wedding ideas that you’ll want to see come to life on your big day. In a world full of Pinterest weddings it’s easy to get weighed down by all the fabulous ideas available. We think a good place to start is with a theme and if you’re planning your big day it’s likely you already have one in mind. Whether that’s modern, classic, vintage, rustic or whimsical it’s a good to have an idea. The logistical side of weddings also requires careful planning and the little details should never be overlooked. To help you with your wedding planning we’ve put together the ultimate guide for brides hoping to plan a unique wedding with advice on everything from the venue down to the favours. Your dream wedding doesn’t have to bust the bank and it’s important to have a budget in mind before you start planning. As soon as you have decided on a budget and date you can start getting quotes from venues, caterers and live bands. Tip: Saying ‘I do’ on a Saturday in July means you’ll pay premium prices. Opt for a midweek ceremony or get married out of the peak wedding season to make your budget go further. 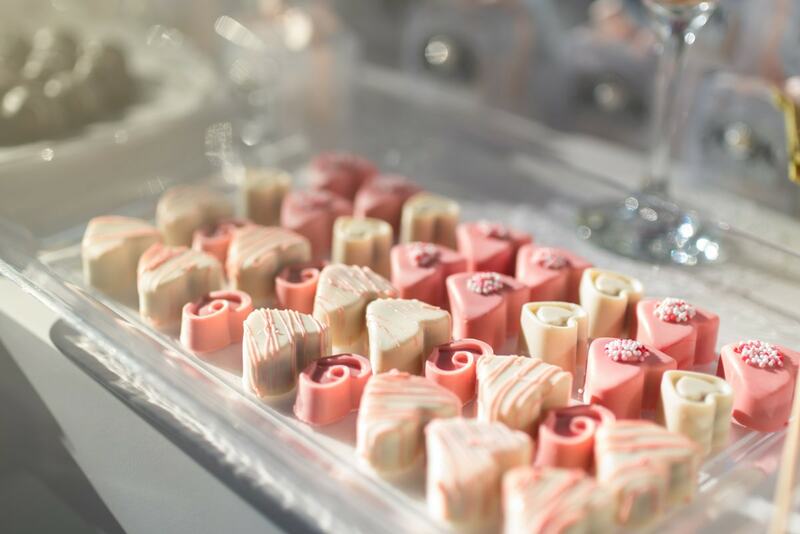 Tip: Forget the traditional wedding cake and try doing a dessert bar instead to give your guests great food at more affordable prices. 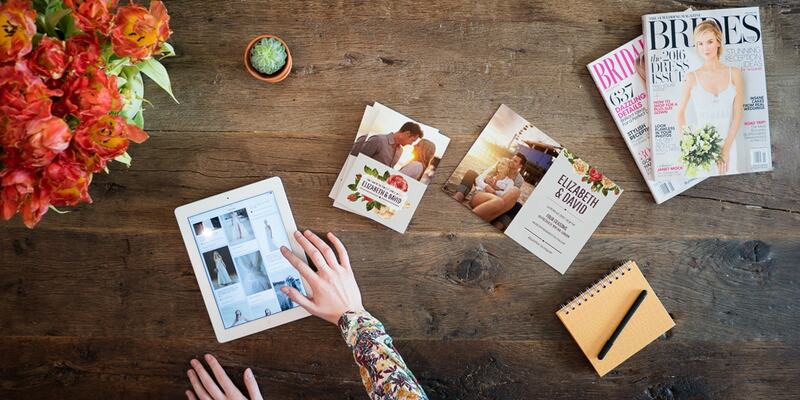 It can be tricky deciding how you want your wedding invites to look and what you write on a wedding card. It’s nice to have a coherent theme running from the ‘save the dates’ to the invites that also ties in with your overarching wedding theme. Tip: Design your cards for ‘save the dates’, invites and thankyous with the same theme. Matching wedding sets are perfect for any type of wedding. 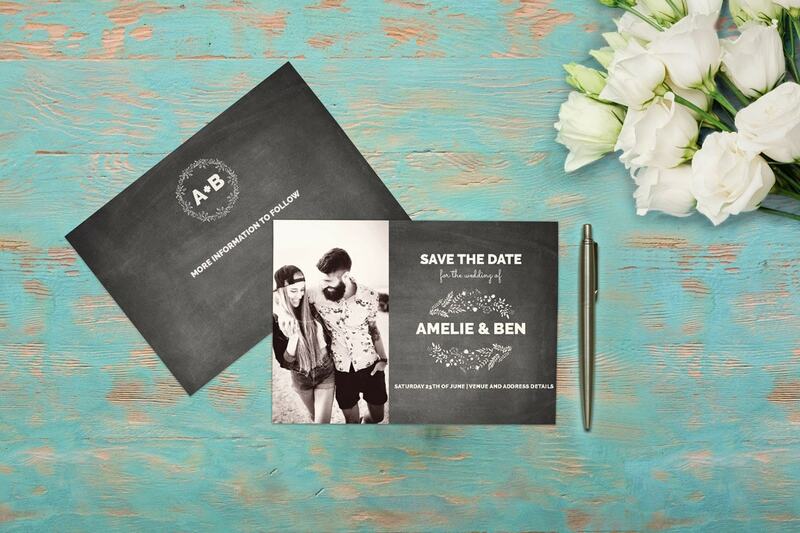 Tip: Use a photo of you and your partner to give the invites a personal touch. Tip: Wedding invitation wording is a place to get creative, but not too creative. You need to feature all the key details like venue, date and time but don’t shy away from a cheeky message at the end that will show off your values as a couple. And don’t forget to ask your guests to RSVP with dietary requirements. You don’t need to stick to the usual traditions – your wedding day is a blank canvas to fill with special moments and all the things you love. 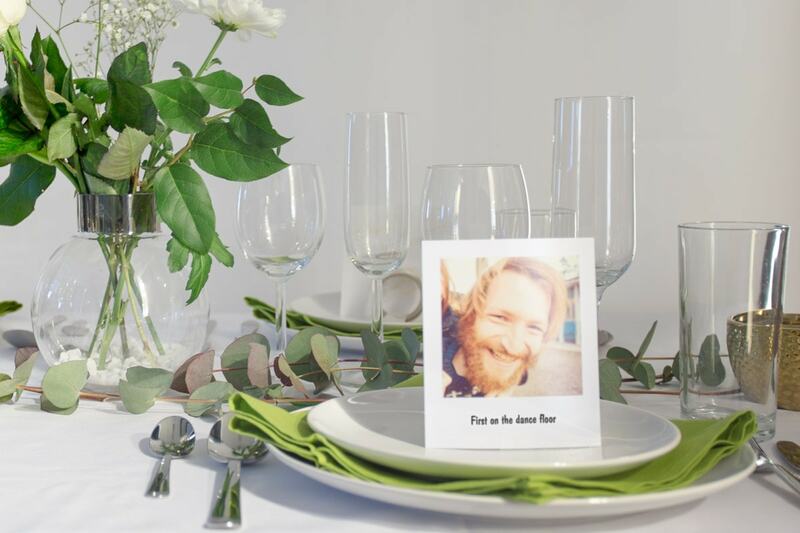 We obviously love photo themed ideas because they bring a personalised touch like nothing else. These wedding and table decoration ideas will help you to make the most of your venue and create an atmosphere that the guests will talk about for years to come. Tip: Create your table place cards out of retro prints. Scroll back through photos of the guests and pick your favourites to feature. You could even label the photos with cheeky captions like ‘first on the dance floor’. Vintage brides will love this idea. 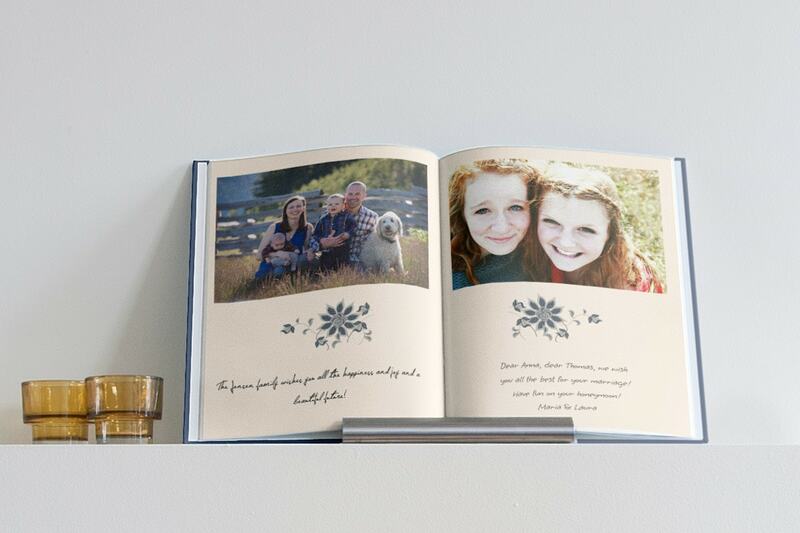 Tip: Make a photo book and cram it full of photos of the guests. Ask your friends and family for a photo before the wedding and then make the book yourself… Leave it open on a table inside the venue for people to sign and leave messages in. Perfect for a modern wedding. 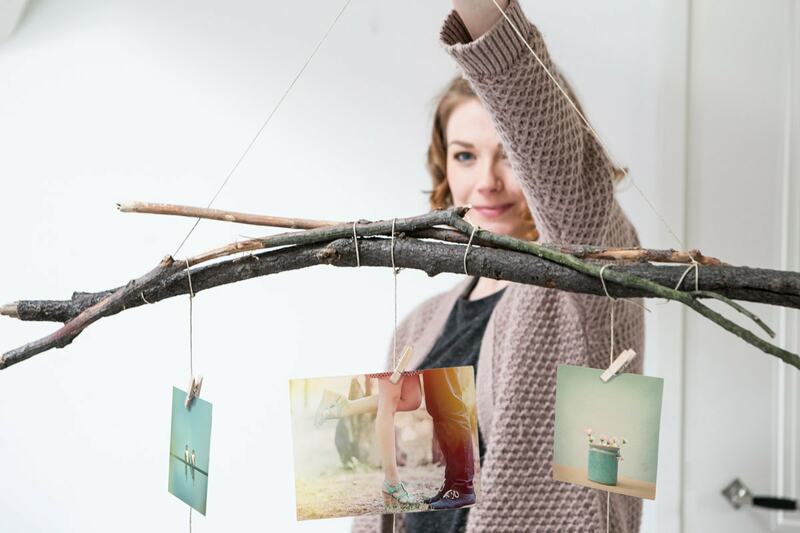 Tip: Hang some prints around the venue to create a photo garland or photo hanging that the guests can look at and you can keep forever. Tip: Roll up some prints inside glasses and maybe add a scattering of tea lights for effect. 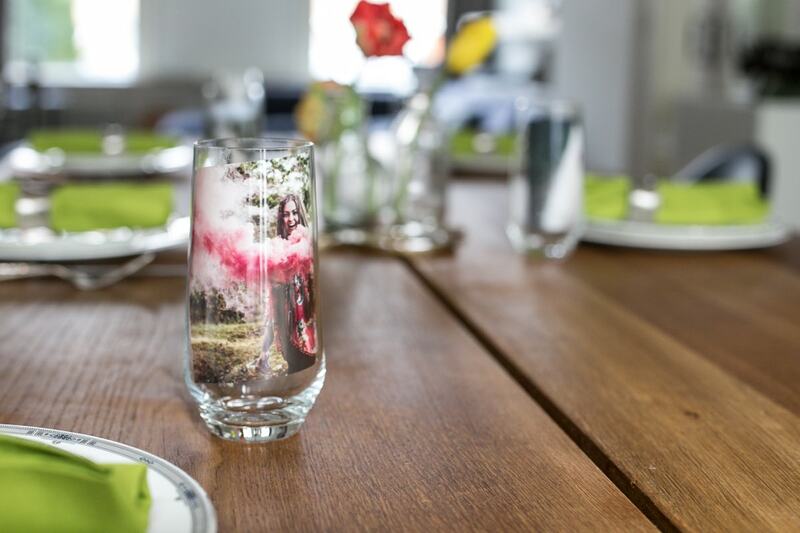 This will give your tables a rustic charm that’s personal at the same time. Tip: You’ll be needing somewhere to keep all those gifts so keep a table free and create a sign with some wall art you can prop up on the table so people know where to leave them. Something simple like ‘cards and gifts for the Mr & Mrs’ will do the trick. 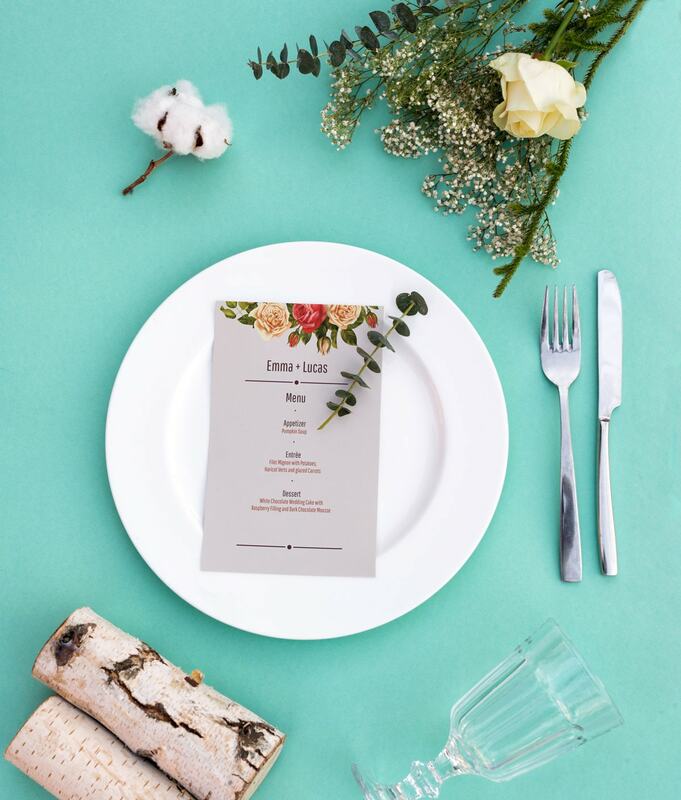 Tip: Print your menus on some cards and personalise them to your taste. Flowers are perfect for classic weddings while bright colours will work for a seaside venue. 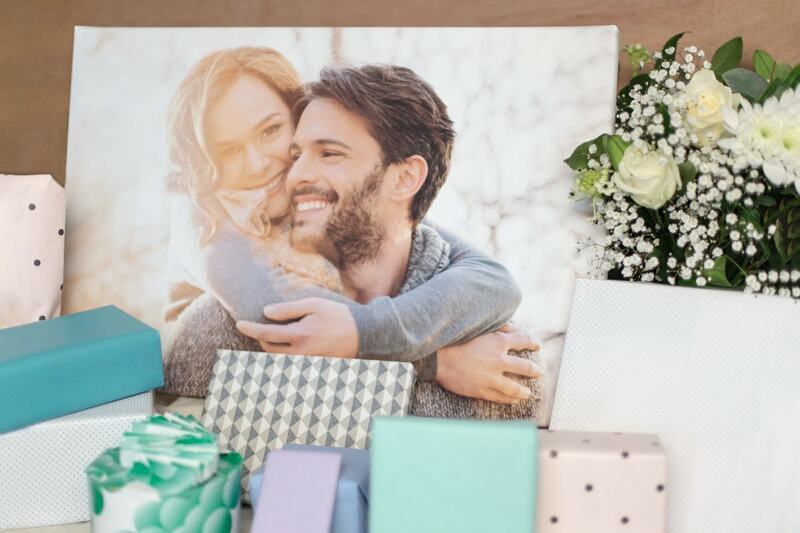 Highlight your unique wedding theme with the favours, thankyous and bridal party gifts. A lot of work goes into a wedding and there’s often lots of people helping out. Show them how much it means to you with thoughtful personalised gifts. 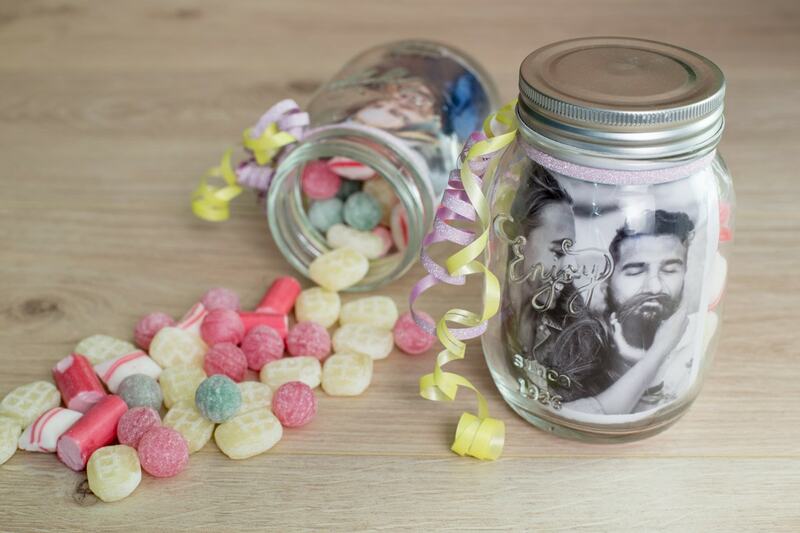 Tip: Get your hands on some clear glass jars and roll up a photo print of the couple with some sweets for a personalised favour that’s simple to create. 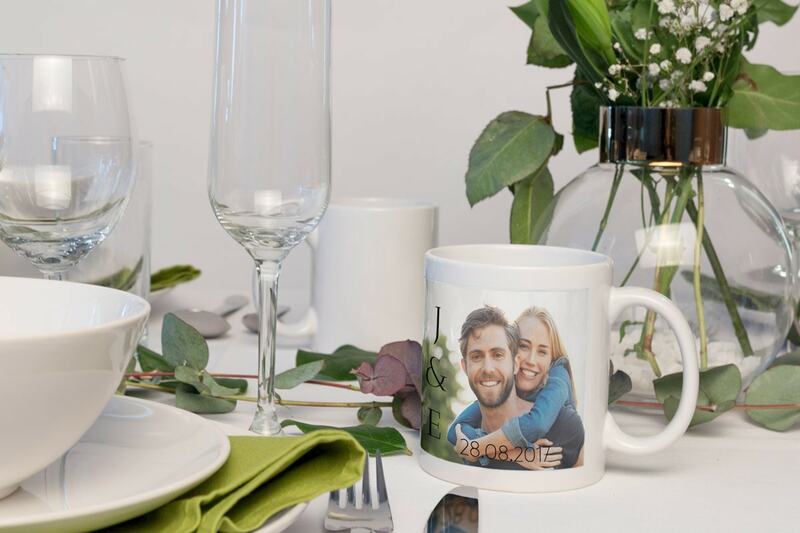 Tip: Create personalised mugs for all the guests and leave them on the tables. The bride and grooms initials with the date is simple but effective. Tip: Make photo books for the bridesmaids and groomsmen as thankyou gifts after the big day to show them how grateful you are for their help. Include pictures from before and during the wedding. 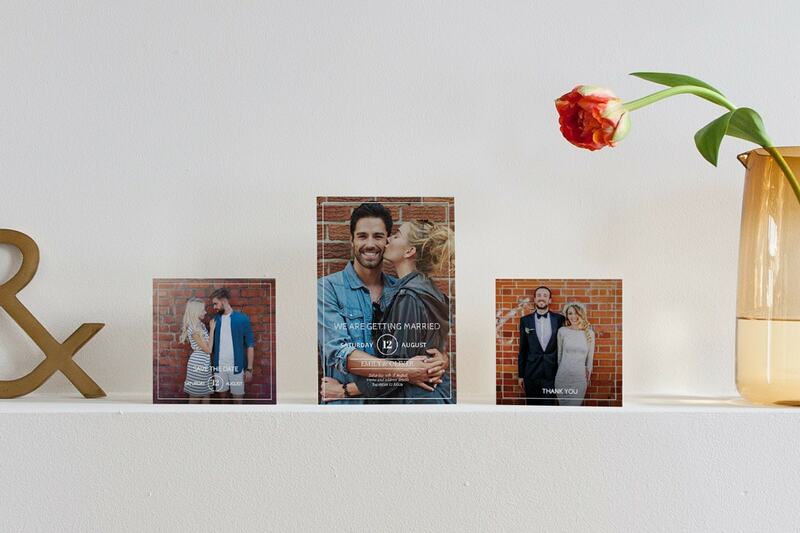 Tip: Send thank you cards to all of the guests featuring your favourite photo from the big day. 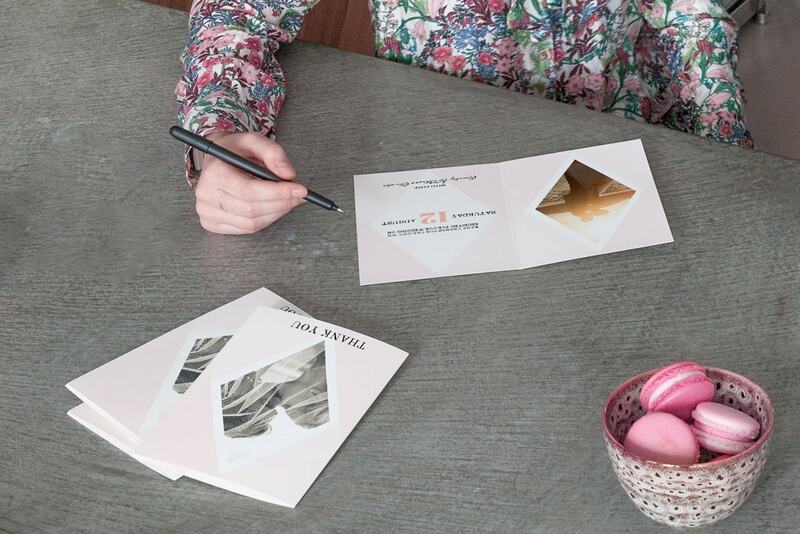 Include a handwritten text saying thank you in the wedding card for a personal touch. 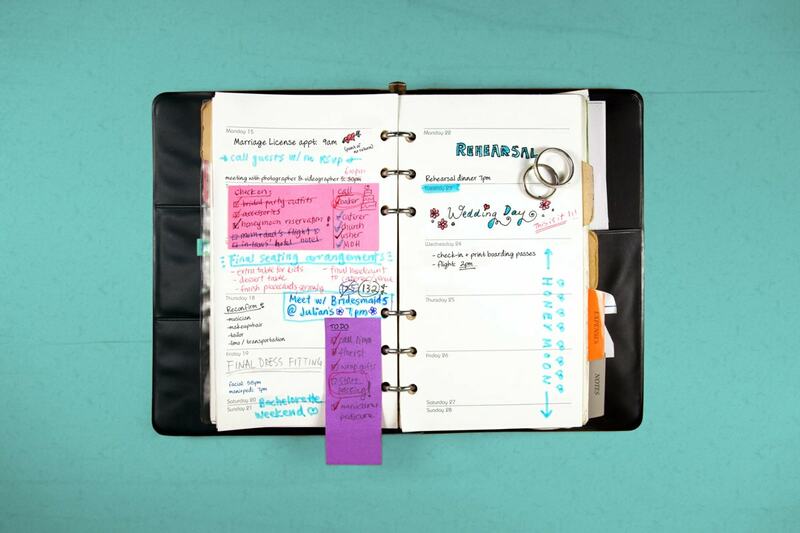 Armed with all these ideas we bet you can’t wait to go away and start planning for yourself. Whatever theme you end up going with and whatever decorations you choose to make, we’d love to see the results. Share your wedding photos featuring albelli products with us using the hashtag #myalbelli so we can see what you’ve been making. For more inspiration you can also check out the #myalbelli gallery.